The 7 Days of the Dog Have Arrived! Cover of my latest book, the “Dog Week Bible”! 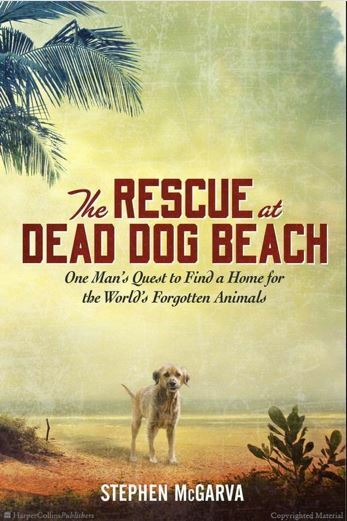 Stephen McGarva’s book The Rescue at Dead Dog Beach was successfully launched on National Dog Day in August. 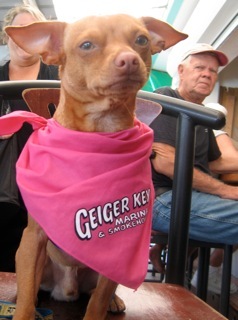 The book marketing department at Dey Street Books (Harper Collins) asked me if I could continue to share the book bark during the 86th Observance of National Dog Week. 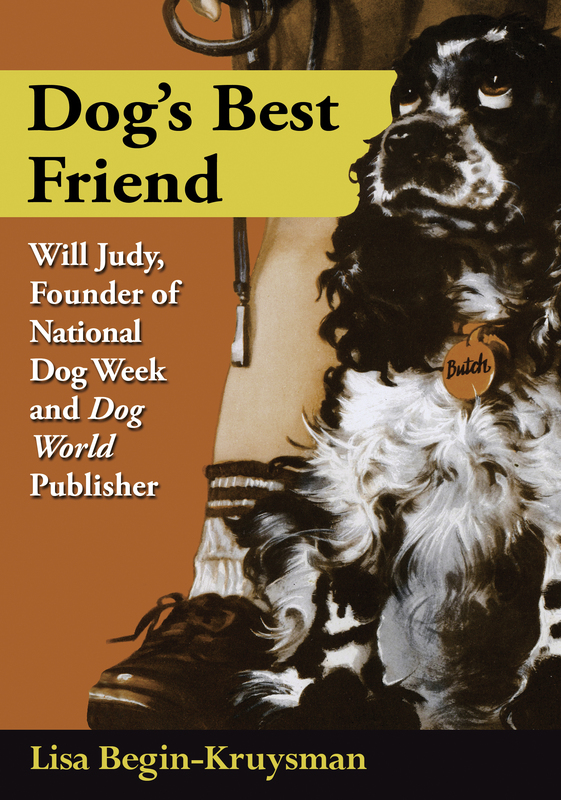 NDW was launched in September 1928 by Captain Will Judy, minister, lawyer, decorated WWI veteran and publisher of Dog World magazine for four decades. Will Judy wrote, “You strike your dog, you whip, you even lower yourself and debase your soul to kick at him and you really kick your own dignity into the ditch.” If you agree with Judy, then surely, many of the “humans” found on the pages of this book are destined to spend an eternity at the bottom of a ditch. Stephen’s book is his memoir of his time spent in Puerto Rico where a day at the beach turned into a two year personal mission to save the lives of satos (street dogs) in this Commonwealth, often with dire consequences. Authors are often advised to “show, don’t tell” in their writing. Stephen has done a very good job of that, taking his readers to the trenches of that hellish killing field, surrounded by hundreds of unwanted, neglected, abused albeit loving dogs. I have to admit, while I had read about the sato population in PR, I truly was not aware of how horrifically these dogs were treated; stabbed, shot, hung and run over by cars by “men” who were worried about the tourism dollar or just needed an innocent target on which to vent their depravity. This island is also popularly known in Spanish as la isla del encanto, which translates to “the island of enchantment”. I doubt anyone in their right mind would find anything enchanting about this scenario. But not all island inhabitants were bad, and Stephen knows that he was just one more soldier in a daily battle trying to win the war on ignorance and abuse and do some good in the world. He makes that clear in this book. It strikes me that many authors are also artists, and I understand that you are a Fine Artist. Can you talk about your training and the types of art you produce. As an artist myself, the imagery evoked by your writing lends itself to some potential artistic expression. Are dogs ever the subject of your subject matter, or do you plan to include them at some point? For the most part, I’m self-trained as an artist. I guess if I had to describe myself, I’d say I’m a sculptor that loves to draw and oil paint. In the past I worked mostly in metal and glass. However, more recently I’ve been working in clay on a series inspired by dogs and their relationship with humans. You have volunteered elsewhere. Can you tell us about your work with children in Southeast Asia? As a child I dreamed of traveling and exploring the world. I wanted to do something that would make a difference in the life of someone less fortunate. So, after graduating high school, I volunteered with a non-profit organization and traveled to South East Asia to work with orphaned children. I had no real skill set to offer. But, I was willing to do whatever it took to help. I cooked, cleaned, treated minor injuries and showed love to kids that had nothing – no family, home, or food except that which we provided. It was a rewarding experience and the most fulfilled I’d ever felt. 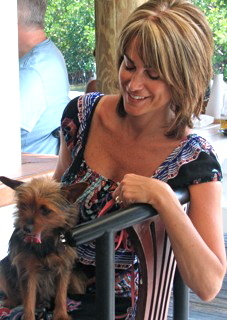 When did you first conceive the notion of writing a book about your time spent with the dogs of Puerto Rico? How did you go about finding a publisher and what was the feedback received? Do you have a literary agent? The idea of writing the book came to me shortly after leaving Puerto Rico. I had been struggling with the wreckage of emotions and memories of what had happened. Initially, I wrote the stories just to get them out of my head. I soon realized there was something really powerful in just trying to make sense of my thoughts and then articulate them in sentences. It was a pretty powerful process and often-quite cathartic. My story was pitched to the publisher thru a client I’d taken for a flight in my tandem Paraglider. He asked a lot of questions and showed interest in my story. A few weeks later he called and said that he’d gotten me a contract to write the book. He also helped me to connect with my literary agent at Sterling Lord Literistic, Inc in NYC. The old saying, ‘Can’t we all just get along’ comes to mind when I think of rescue rivalry. I often find it hard to believe that animal rights groups criticize and fight with one another on public forums. In the fight over the moral high ground, media attention or for the top spot at the money trough, rescuers often lose sight of their original goal to help animals in need. Unfortunately, this sort of behavior makes it very difficult for the general public to take rescuers work seriously. If rescuers spent more time working together rather than against each other, more would be accomplished. At the end of the day, it’s supposed to be about the animals not our egos. I know it has bothered a few individual rescuers that I (the newbie) managed to get international media attention and a book deal. I’ve never had an ulterior motive for anything I’ve done with the dogs. I did what I did because it was the right thing to do… I’m just a guy that stumbled onto a bad situation and chose not to walk away or turn a blind eye. You also write of some religious and cultural norms of the region that may influence pet welfare, such as the woman who was upset with you for having a severely injured dog euthanized because she felt you should let God take care of these matters, or some males in the Latino culture who do not want male dogs neutered. Does this contribute to the stray dog issue? There will always be cultural and religious differences impacting the way people think and respond to situations. I’ve always tried to be sensitive and respectful, but when it comes to another living creature suffering due to someone’s inability to make a difficult decision based on religious or so called moral beliefs, I draw the line. It’s not always easy to make hard decisions and I realize I won’t likely win the popularity contest. I try to encourage education and offer statistics on spay and neutering a pet to counter animal population problems that plague most countries in the world. It saddened me to read that many of the so-called stray dogs, or satos (street dogs) had actually been pets at one time. It was difficult to read that many of the local vets penalized these dogs by refusing them medical treatment without comprehending (or ignoring) the fact that these sickened and injured animals might have been the very same dogs they treated at one time. Were they afraid of not getting paid, disease, or they did not see them as worthy of their time and attention? Getting medical treatment for a Sato is a complicated situation at best. Considering street dogs are thought of as vermin and nothing more than an eye sore on the island. Vets are often afraid they’ll lose their regular paying customers if they treat a mangy unhealthy ‘Sato’ in the same building as someone’s healthy household pet. When a vet is willing to help, the dreaded topic of money and payment will need to be addressed. Diagnosing and treating a street dog with multiple health issues is very expensive. I know a few vets that have been stuck holding the bill after treatment was done. End result is a leery vet that doesn't want to work with rescuers or street dogs. What is the current status of the sato population now? Sadly, the Sato population remains much the same. It’s estimated there are likely a quarter of a million strays roaming the island. Animal rights groups have offered help to create long term sustainable solutions such as education programs in schools and low cost spay and neuter clinics. Unfortunately, in Puerto Rico the Island hotelier association and government officials continue to push back, stating they don’t need any outside help. I believe their pride is clouding good judgement which will ultimately have a negative long term impact on how the world views the island. Are the problems facing dogs in Mexico similar to those in PR? If not, what different approaches are used in rescue? The problems facing the dogs are really the same in both countries. However, the major difference I’ve experienced is that like Puerto Rico, Mexico has been willing to accept outside help from rescue groups. Many of the hotelier associations and local government officials are ready and willing to embrace change. I read how many tourist resorts had a big hand in the maiming and killing of unwanted dogs. Have the tourist resorts had a change of heart with the your work and the release of the book. Do you think tourists can use “tourism” dollar-power” to influence the situation positively. If yes, how so? Tourist dollars are a powerful tool for implementing change to the problem of animal welfare in Puerto Rico and other tourist destinations. The Puerto Rico tourism board as well as the hotelier association on the island have been slow to respond and reluctant to change their current practices of rounding-up and killing unwanted dogs. This practice has to change or tourists will stop spending their money vacationing on the island. In recent past, threats of a tourist boycott inspired the government to listen and begin to address the issue of animal welfare. I hope that the release of my book will re-apply pressure and spur officials to do the right thing. The Achates Legacy foundation operated for approximately 4 years until the board members voted to dissolve the foundation due to a lack of funding. I continue to support several groups working on and off the island and Mexico. The organizations I mention in the back of the book are a few of the groups I have worked with and support their efforts. Do you think that your book would translate well to film? I do think that the book would translate nicely to film. 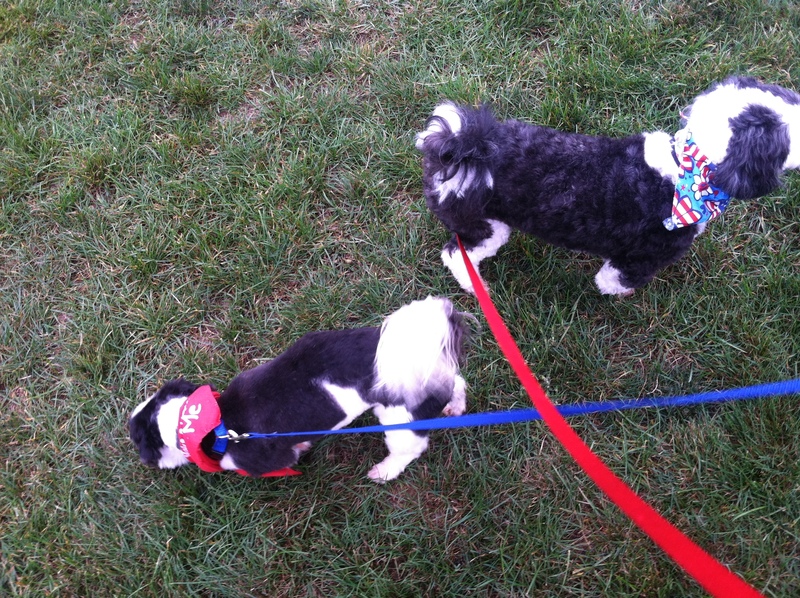 I’m a very visual person, so I was always able to imagine my journey with the dogs as a movie. Now that the book is out, many people have asked if there’s any possibility it will be made into film. During a few recent radio interviews, the on-air personalities asked if I’d thought about what actor I’d like to have playing the part of me when the movie comes out. I just laugh saying I really have no idea… They suggested a couple of possible actors and said they hope it makes it to film. Do you prefer the writing process to that of creative art? Do you have plans for another book project? I prefer to work in my studio creating and expressing myself thru fine arts, but I have learned to enjoy expressing myself thru writing as well. I think I’d like to give illustrate children’s books a shot. I’ve already started working on some ideas. Kids and dogs are my two favorite subjects. I’m sure I’ll find a way to combine the two. Happy National Dog Week to all those who rescue, foster, transport, arrange for spay and neuter clinics, combat puppy mills, fight Breed Specific Legislation, volunteer and raise funds for displaced Companion Animals, train our service, military, police and therapy dogs, represent dog’s in art, music and words, practice responsible pet ownership and at the very least, show some compassion to man’s best friend with a kind word and show of affection whenever possible. Thank you Stephen, too, for sharing your story and for your support on my work on behalf of National Dog Week. Thanks to Parkeast Literary Agency and McFarland & Co. also. Teddy meets a sweet sato named Louie who awaits his new home through the efforts of Wag-on-Inn Rescue in NJ – Finding homes for satos for over seven years!